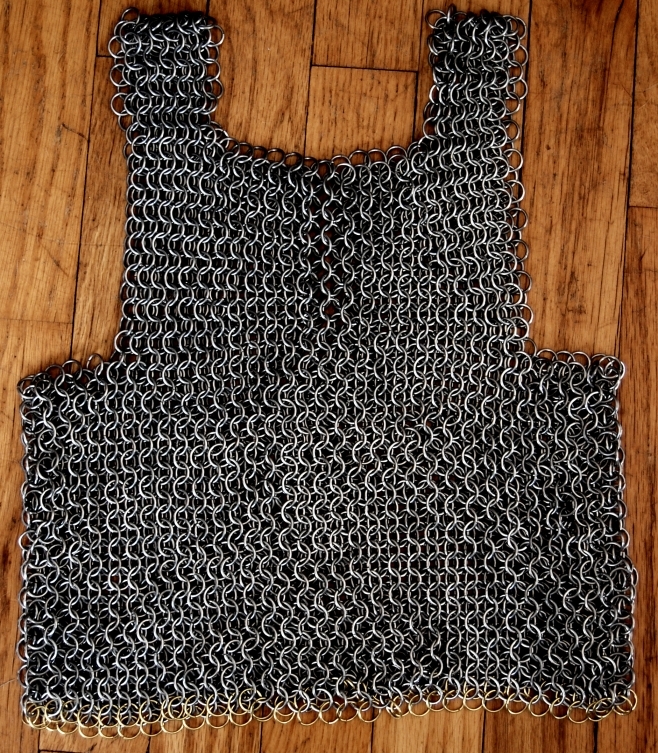 I casually said to someone that I would make their child a chain mail shirt. I even said that I thought it would be fun. It was fun but turned out to be a bit more work than I expected. Approximately thirty hours of work later, many sore fingers, and about two dozen #1 jewelers saw blades , I had a finished chain mail shirt. This shirt is 18″ tall and 13″ wide. It will fit on a three year old. I learned some helpful tricks about making chain mail. 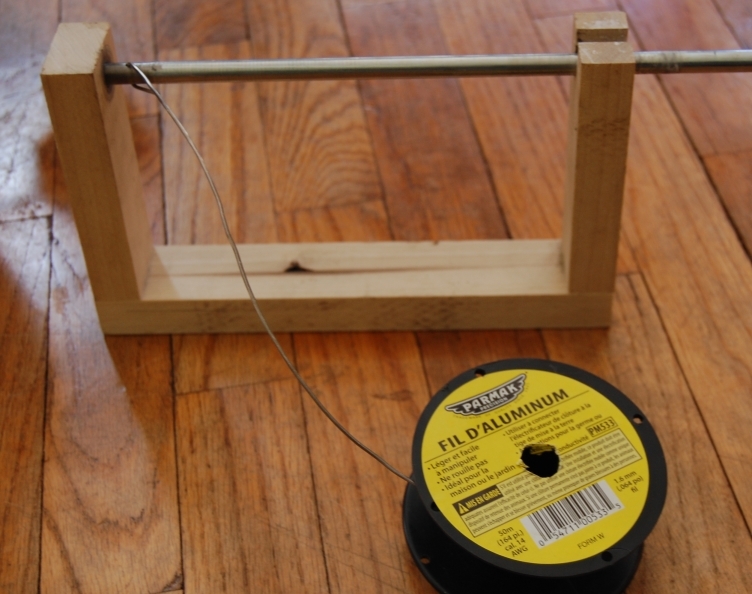 For this jig, I drilled a small hole through a 3/8″ mild steel rod from the hardware store. You can see the aluminum electric fence wire I used going through the small hole. 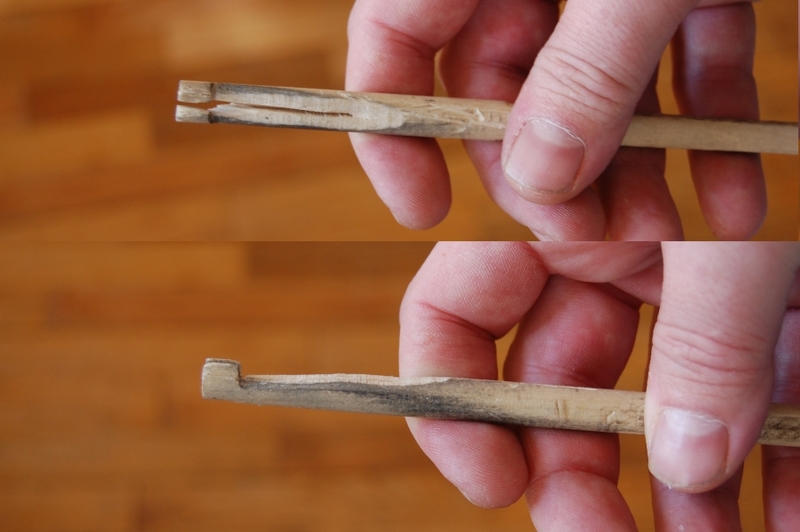 To make the rings, I chucked an electric drill to the rod and turned it slowly in the wooden form you see it sitting in . I found quickly that a leather glove helped my fingers survive. If I were going to make another shirt, I would probably cut the rings apart with snips instead of sawing them. I thought of changing mid-stream on this shirt but the rings looked different from the ones I had already woven together. When I was working on this, I found a great trick online but cannot find the tutorial again. It makes everything go twice as fast. 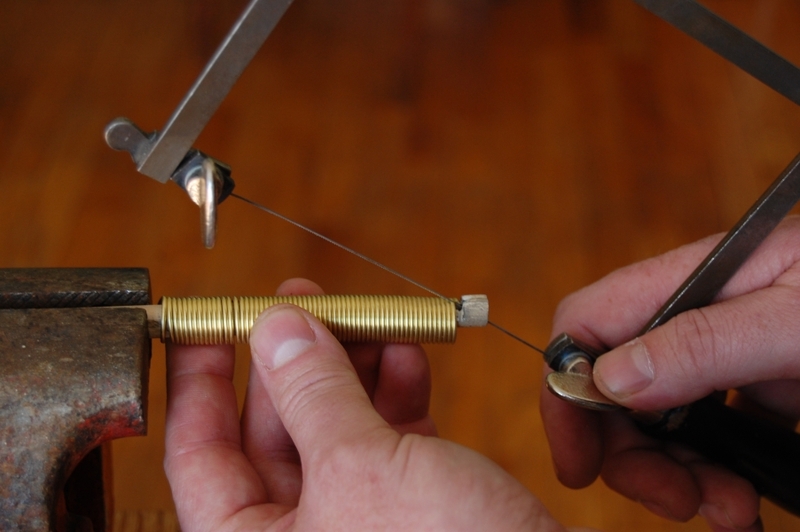 Briefly, you make chains of rings, two into one, as long as you want the finished section to be. Make many of these, then join them. I see that most tutorials show people adding one ring at a time into a mesh of fabric and that was horrible for me. Making the long chains and joining them made me twice as fast and far less frustrated. If that doesn’t make sense, email me – jim (at) makestuffwithyourhands.com and I will try and explain or post an example. This entry was posted on October 30, 2010 at 6:28 pm and is filed under Chain Mail, Gear Making, jewelry making, metalwork, Tool Making. You can follow any responses to this entry through the RSS 2.0 feed. You can leave a response, or trackback from your own site. you know Jim, it may have been a job for you… but you had fun doing something you had never done before…. and that kid will remember it forever!!! and isn’t that what it is all about? Steve, you are completely right. I am really glad that I made this and I am sure that the boy getting it will not forget it. This is the coolest thing that I have seen in a long while. Thanks for sharing Jim! This is awesome! I highly recommend purchasing the Kevin Potter Koil Kutter to save your hands and fingers of pain later. I did a 1,000 perfect jump rings in 10 minutes yesterday and a few thousand a week before. Thanks for another great tip Catherine.